Spigelian hernia also referred as lateral ventral hernia is a type of hernia that originates from spigelian fascia. This point is basically a junction between rectus abdominis and smilunar line. Spigelian hernia does protrude downward like other types of hernia rather than this it penetrates between muscles of abdominal wall. Due to this reason it does not cause swelling or protrusion that is visible through outside the body making the diagnosis more difficult. Spigelian hernia is not so common as compared to other hernia. Spigelian hernia are small in size so there is increase risk of strangulation and should be repaired as soon as possible to minimize further damage. There are some diagnostic techniques through which it can be diagnosed like ultrasonography, CT Scan, Barium enema test. CT Scan gives maximum accuracy in case of spigelian diagnosis. Pain in the region of spigelian fascia due to strangulation is one of the major sign that points out diagnosis towards spigelian hernia. Spigelian hernia is different from other hernia so pain radiates due to penetration between abdominal muscles. Initially pain may be negligible but with the passage of time it may become severe. Initially symptoms of spigelian hernia are not so prominent patient feels quite normal due to very low pain, no complications and severity. However, some commonly observed symptoms of spigelian hernia are discussed below. Some patients are genetically predisposed to hernia due to defects in abdominal wall at some point. Such kind of patients may have hernia at any stage of their life due to increase risk of abdominal wall rupture. Genetic predisposition is one the major cause of hernia in both men and women. Weight lifting is another common cause of hernia because it increases pressure on abdominal wall. Patient above age of 40 years are more prone because muscles of abdominal wall become more fragile and if patient does heavy weight lifting then he is most likely gets spigelian hernia or other type of hernia. 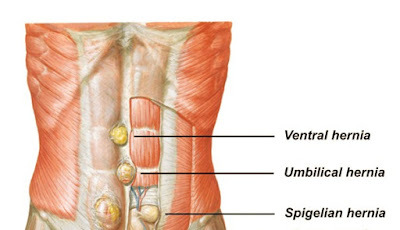 Spigelian hernia may also likely to develop in case of trauma or injury to abdominal wall muscles. 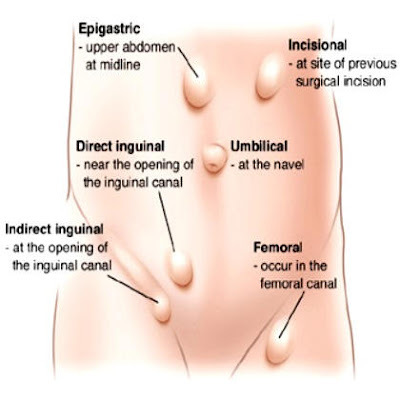 Most common examples of these type of injuries are Wrong incision to abdominal wall during surgery or deep cut or wound inside abdominal muscles. Any problem that increases pressure on abdominal wall like in case of obesity, weight lifting, excessive accumulation of air in the abdominal, excessive coughing or frequent vomiting. Obesity is most commonly associated with spigelian hernia. Reason is same as mentioned above that obesity causes persistent pressure on abdominal wall that may lead to rupture of abdominal wall muscles. As mentioned above, these hernia have high risk of strangulation, so surgery is only option left to repair these hernia. There are two types of surgeries that can be performed to repair spigelian hernia laparoscopic surgery and general surgery. General surgery is of choice when affected area is too large and cannot be managed by laparoscopic surgery. However,general surgery is more complicated as compared to laparoscopic surgery and recovery time is much more than laparoscopic type. In mild to moderate cases laparoscopic surgery preferably performed due to rapid recovery, less complications and easy to perform.